Throughout her life, Koko's abilities made headlines. After she began communicating with humans through American Sign Language, she was featured by National Geographic — and she took her own picture (in a mirror) for the magazine's cover. That cover came out in 1978, seven years after Koko was chosen as an infant to work on a language research project with the psychologist Francine "Penny" Patterson. In 1985, the magazine profiled the affectionate relationship between the gorilla and her kitten: Koko and All Ball. Koko amazed scientists in 2012, when she showed she could learn to play the recorder. The feat revealed mental acuity but also, crucially, that primates can learn to intricately control their breathing — something that had been assumed to be beyond their abilities. Her ability to interact with people made Koko an international celebrity. 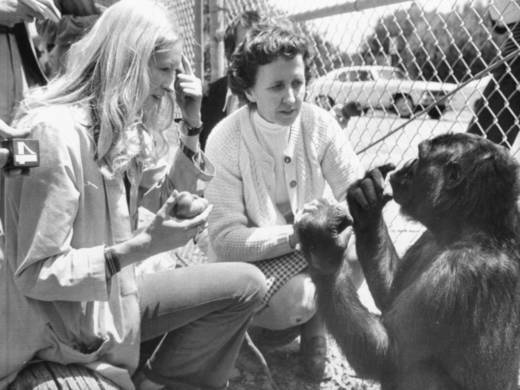 But she also revealed the depth and strength of a gorilla's emotional life, sharing moments of glee and sadness with researchers Patterson and Ron Cohn. "Famously, Koko felt quite sad in 1984 when her adopted kitten Ball was hit by a car and died. How do we know? Here is nonhuman primate grief mediated through language: In historical footage in the film, Patterson is seen asking Koko, "What happened to Ball?" In reply, Koko utters these signs in sequence: cat, cry, have-sorry, Koko-love. And then, after a pause, two more signs: unattention, visit me." Now, it's humanity's turn to mourn Koko. "Legit bawling like a baby right now. This news just breaks my heart. From an early age I was fascinated with Koko and she taught me so much about love, kindness, respect for animals, and our planet." Over the course of Koko's life, sentiments like that have been counterbalanced by questions about her ability to use language in original and complex ways. And for Koko and other research subjects, there has also been skepticism over how their handlers interpret the animals' behavior. With Koko's passing, the Gorilla Foundation says it will honor her legacy, working on wildlife conservation in Africa, a great ape sanctuary in Maui, Hawaii, and a sign language app. The foundation says those who want to share condolences can do so by emailing kokolove@koko.org.